Unless you somehow get permission to park your RV beside Old Faithful during January in Yellowstone, I bet you will never see as many geysers through rime coated RV windows as we have seen this week. Randomly, PVC standpipes on the sites surrounding us fracture gushing fountains of shimmering water. Golf cart borne emergency repair staff rush to mend splintered pipes and restore water pressure to the park. Around us motorhomes, abandoned by owners seeking refuge in nearby motels, have extended icy stalactites from their underbellies. I fear these formations foretell a sodden surprise for the returning owners. We have the opposite problem. Day two of the storm, 5am, 10 degrees outside and we have no water. A huge disappointment as we thought we had protected ourselves from a frost induced drought. Using our water pump and tank rather than the park’s fragile connections seemed a safe bet. Today our normally vocal water pump is silent. The opened spigots are dry. Storm immediately assumes that the pump has inconveniently chosen today (of all days) to expire. I am not so sure. We are definitely NOT the only ones with problems! Nonetheless Storm shops online to find a replacement pump and get it on order. With the Postal service ice bound (4 days no delivery), we can’t count on receiving a new pump soon. Storm’s phone calls to local building supply stores confirm that other desperate folks have already cleared the shelves of emergency plumbing supplies. I call the front office here at the park for help. They inform me that within walking distance is Decks and Docks Lumber Company that has the parts we need. They are correct! Although I need exercise after 2 days RV bound we do not walk the mile through 8″ of snow to the store. The Jeep delivers us safely to the unplowed parking lot. Happenstance parking around an ATM there creates gridlock which Storm deftly circumnavigates. Inside, we are warmly greeted by a young lady bundled in Eskimo-like fashion. She escorts us through the store collecting precisely the parts we need for our task. With heat strips, a 50% off water hose that we can cut to length, some pipe insulation and duct tape we plow back to the RV to start building. 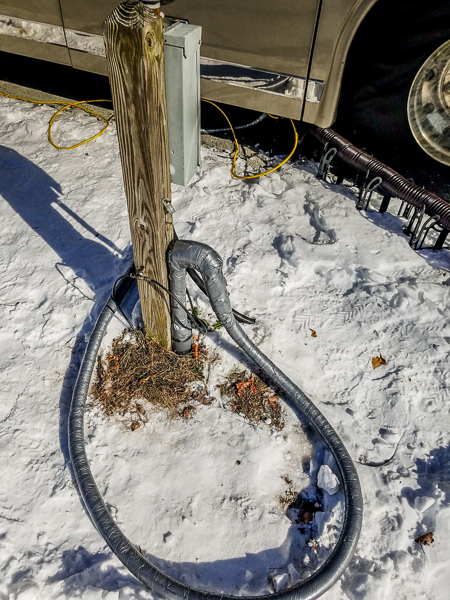 The finished heated water line connection – everything is covered with insulation! 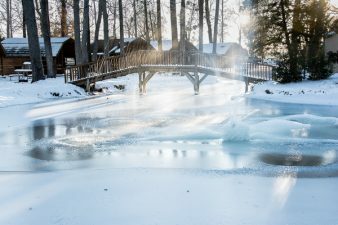 We construct a heated water line to connect the RV to the park’s water. Insuring that we can insulate and cover the park’s standpipe with our contraption, we take it outside to install. Heaven forbid that our side flows warmly when connected only to have the park standpipe rupture. Once we have water again Storm turns his attention to improving the heat stream going to the water bay. He does this for a couple of reasons. 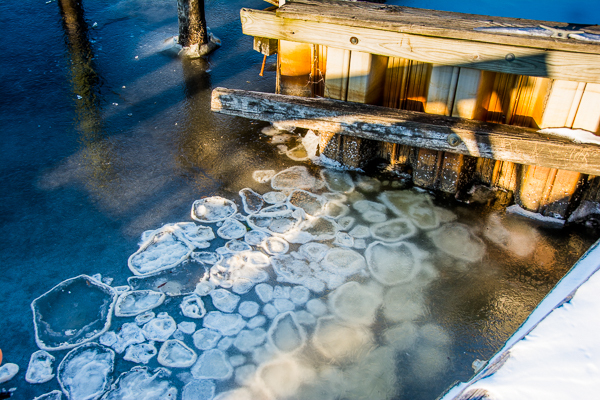 Reason one is that the water bay froze shut overnight. 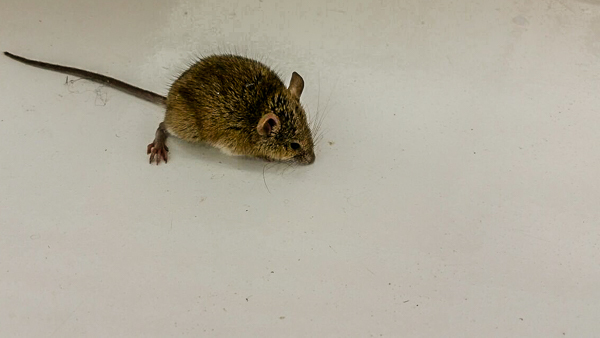 A tiny drip from a quick connect we were using formed a 1/2″ x 3″ ice seal at the doors bottom requiring a chilly struggle between Storm and the door before release. Reason two is that while we are working on the ice compartment sunlight is heating that side of the RV. As the water pump which is housed in this bay warms, it blurps its recovery (blurp is the sound it makes when it is running). We are concerned that the single digit temps tonight may freeze something we have overlooked. Storm remembers that there is a thermostat he can adjust in the water bay so he cranks that to wide open. There is also an incandescent light fixture in the bay that puts off a lot of heat when lit. We never used it before, but tonight we leave the light on! After our adjustments, the water bay temp reads near 80 degrees so we become overconfident. We forget to open the cabinet doors at the vanities and kitchen sink. In the morning, when I try to run warm water for teeth brushing I get nothing. What?!? Eight degrees was too much for the pipe in this vanity suspended in the air over our wheel wells. We shoot hot air from my hair dryer under the lifted up bed and into what seems to be “outside” for about an hour. Hot water finally spurts out. We detect no leak so we appear to have narrowly avoided a soggy disaster ourselves. 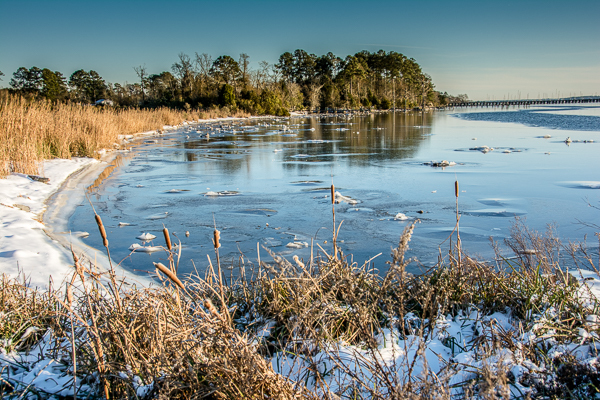 Frozen Neuse River – are those tiny icebergs? We endure two more nights of single digit temps before receiving blessed relief from the cold. I am sure that an infrared photo of our RV would show heat flowing out like a halo around us. 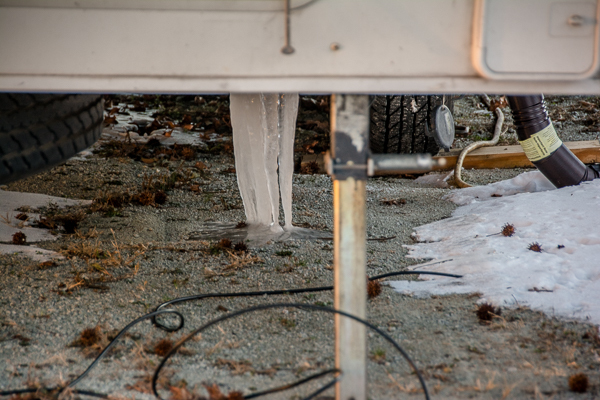 It seems heating the outdoors is the only thing that will prevent frozen pipes in an RV. Thanks to all of you who commented on my last post and to those who kindly offered us warm places to stay during this cold snap. We wish we could have taken you up on the offers, but we truly believe the RV’s survival odds are greater with us inside. Based on what we saw happening with other RVs, we hated to leave the bus to its own devices during this storm. Who knows if the “automatic run” feature of the generator will kick in “this time” if the power goes out? If a pipe does burst, we would rather address the leak sooner rather than after the RV floats away like the Titanic among the icebergs. Plus, Storm has to continuously oil the “angry crickets” (thanks Monte for giving me these words to adequately describe the sound of those squeaky bearings) who inhabit our front gas heater. Since it is this furnace which heats the water bays, he does not want those bearings to lock up. New parts are now on the way to permanently repair that fan box (if the Postal Service ever decides to deliver here again). 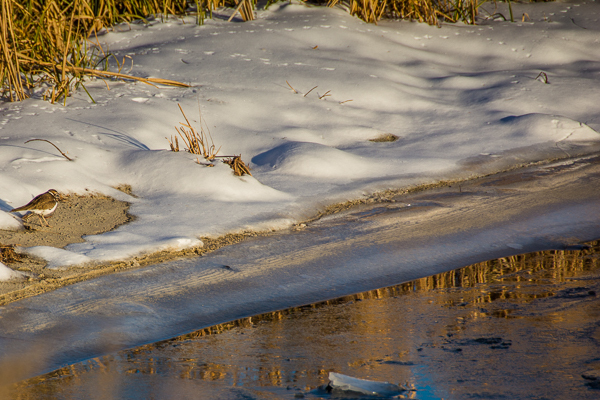 For us the closest non-frozen place for an escape was Arizona. In hindsight a drive to Arizona would have been totally worth it! Hey – do I get a diploma from the School of Hard Knocks for this?? Well at least you weren’t bored during the cold snap since you had plenty to do. 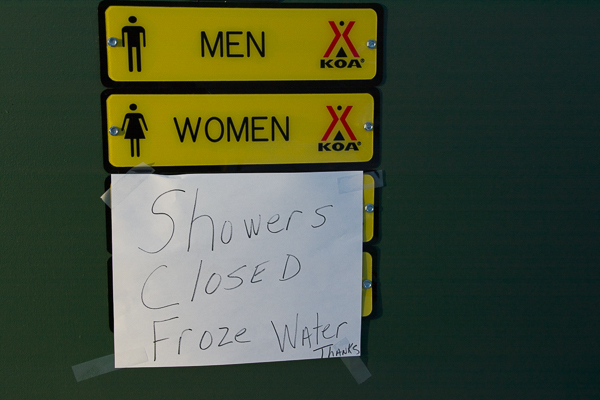 I hope no water connection in the RV stressed by the cold belated breaks. How well did your furnace keep up with that killer cold? You picture of the Neuse River with the cattails reminded me of growing up as every interstate borrow pit and shallow marsh along Lake Erie and its feeder creeks would sustain a bumper crop of cattails and would freeze solid most winters. We were definitely not bored! Furnaces worked great especially considering the heat loss through the slides. Glad we burn diesel for furnaces. Our neighbor told me that his LP tank ran out of gas every morning at 4am during the single digit temps. He had to refill 5th wheel LP Tank everyday. Amen to that!! Glad to hear you guys made it south before the weather fell apart. Enjoy the sunshine and warmth for us too! To reach the port of heaven, we must sail sometimes with the wind and sometimes against it—but we must sail, and not drift, nor lie at anchor.